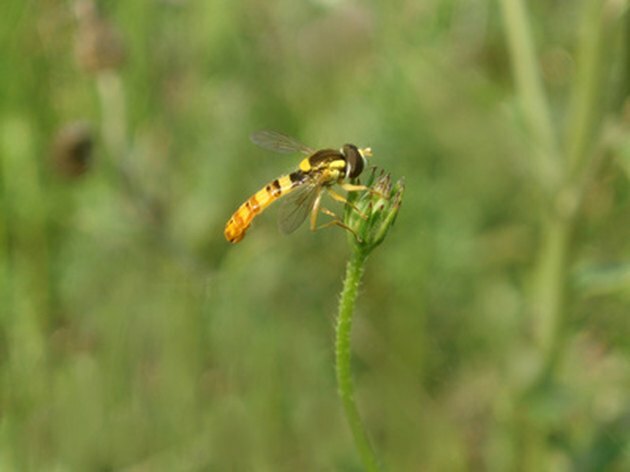 Wasps may be essential players in agricultural pest control due to the parasitic nature, but the stinging insects are unwelcome guests in most homes. Discovering wasps in your fireplace is not only unsettling, but the situation is also potentially dangerous. Effective removal of wasps from your fireplace vent is essential for maintaining a safe home and an operative fireplace. Wasps are parasidic stinging insects. Unlike bees or hornets, social wasps build nests that are tucked away in safe spaces. Often these nests are underground or built into rotting wood, but the protective space provided by your chimney is also a tempting space for wasps to build their nests. The fireplace vent is located at the uppermost portions of your chimney venting system, and wasps don't need to travel far down the flue to find a secluded space for nesting. If you notice the wasps during the winter months, you are likely encountering a few of the young, mated queens of a nest that has died off after the autumn months pass, though there may be remnants of an old nest inside the vent. Wasps nesting in a fireplace vent are likely to navigate the flue and firebox and enter your home occasionally. Wasps pose a stinging hazard to members and pets of the household, and anyone with a wasp allergy is at risk for an anaphylactic reaction that could cause serious health risks. Even if wasps never enter your home through the chimney, a large wasp nest is made of a paper-like material that is highly flammable and could cause a chimney fire. If you don't treat the wasp nests, the wasps will return to your vent each year to establish a colony. Treating wasps in your fireplace vent requires a ladder tall enough to reach the top of the fireplace; a professional exterminator can provide all wasp removal services if you are uncomfortable or allergic to wasps. Wasps are less active during the early morning or at night, so limit your exterminating efforts to these times of day to limit sting risk. Treat the wasps with an insecticide like cypermethrin which is a slow-acting insecticide that kills wasps as they feed off of the contaminated nest materials. A small, smoky fire will also kill and remove the wasps as the smoke reaches the vent, but if your fireplace does not have a door, the wasps may retreat down the flue in an effort to escape. If the wasps are persistent, use a dust stick to apply pyrethrin dust to the infested vent. Blocking the fireplace vent renders your fireplace inoperative, but fireplace vent screens made with thin mesh prevent wasps from penetrating the vent and establishing a nest. If the wasps return, they will look for existing cracks in your chimney; fill any cracks with mortar to avoid providing wasps with a new entry point. Will Insect Foggers Kill Wasps in a Fireplace?